A married lady, Victoria Ulaha is in a dilemma. If it were possible, she would turn back the hands of time and wish all that happened to her never did. This native of Keana Local Government Area of Nasarawa State, is married to John Ulaha, 45, of Awe Local Government Area of the same state, a farmer and carpenter in Lafia. Both husband and wife are in agony as you read this. 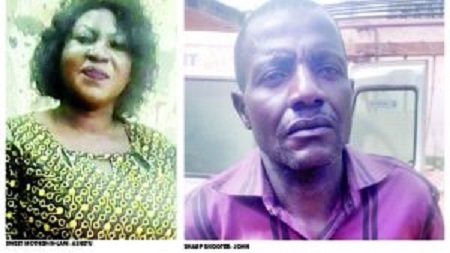 The problem is that in sowing his wild oats, John Ulaha impregnated another woman. What makes his act so obnoxious? The woman in question is his mother-in-law! Right now, his wife is in a great fix as to what to do about the ugly and shameful development. Victoria, blessed with a daughter, lives in Lafia where she manages a provision store while her husband runs a carpentry workshop. But by way of augmenting their incomes, they are heavily involved in farming activities in Awe, where they hire labourers to work on their farms. After the implementation of anti-grazing law in Benue State pushed over 85% of Fulani herdsmen from Benue to settle in Awe, they started destroying, at an alarming rate, farmlands belonging to others. This situation made Victoria to invite her mother who is a widow to come over and help her husband harvest their farm produce of yam and guinea corn since she was very busy with her shop business in Lafia. In the course of time, sometime in mid-September 2017, John and his mother-in-law, Mrs. Ashetu Igbasue, 42, relocated to Awe in order to fast-track their harvesting. Three months into the pair’s sojourn, the bubble burst and Victoria found a big scandal on her hand when her mother came reporting dejectedly that she was pregnant. For whom? Her daughter’s husband! “I’m distressed, I don’t know how to handle this matter,” Victoria told Saturday Sun as she threw her hand helplessly into the air. “I got married to my husband nine years ago. The marriage is blessed with a baby girl and my mother used to come around to spend some time with us especially when she lost her husband. Victoria who said she is ashamed and rattled by the development, promised to take proper action after she recovers from the shock. But for now, she had ruled out the option of opting out of her marriage. The mother-in-law, Mrs. Igbasue, said that it all started in the farm during a joke which led to s*x later in the night when they returned from the farm. “I agreed to his demand for s*x and thought it was just to satisfy his s*xual feelings, but somehow, it became a daily thing,” she confessed. When Daily Sun confronted John with the issue, he was furious that his wife had let the cat out of the bag on what he considers to be a “family affair” and, therefore, supposed to be resolved internally. He claimed that his mother-in-law seduced him by always exposing herself while they worked on the farm, especially, whenever both of them came together to eat. John who attributed the whole scandal to Satan’s work, added that he never imagined that the woman could become pregnant. He admitted that he has deeply offended God as well as his wife for going too far by sleeping with his mother-in-law to extent of getting her pregnant, adding that the pregnancy won’t stand as he will do his best by pleading with his wife to accept aborting it.